Check out seep. - application different than all before. With us, You decide what You want and what people You want to know. No more restrictions. Time for freedom. Now you can, You do not have to. We give you our best solutions and You meet people as You like. We love minimalism. Connecting people is our specialty. Choose your category and meet people around you. Simple, right? Date - meet people like you. Make a date or meet someone you can talk to. Passion - share your passions with others. 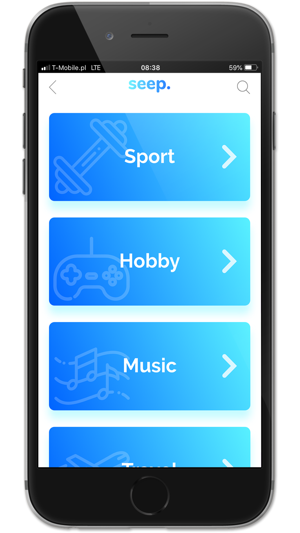 Create your own groups or join to the others and talk about what interests you. In seep. we focus on concretes. Your Profile will be visible only in the selected category, so you will only see those who have chosen exactly what you did. In seep. we love to go out with people and we love to eat even more. We have our Map of Places for You, where you will discover the best places in Poland. And all within one single button. Start creating your own world with us right now. Such a cool app, love idea. 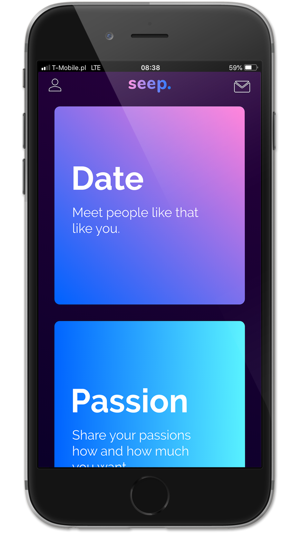 Helpful, easy, and finally something with more options than others dating app. Glad to downloaded on my phone. © Seep Sp. Z o.o.